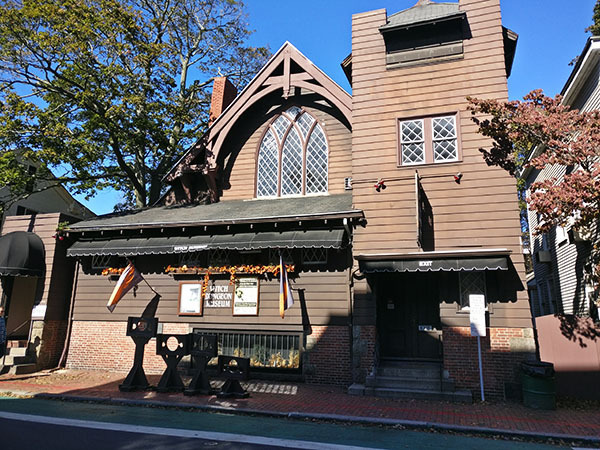 The Witch Dungeon Museum is just one of the witch attractions from which to choose from in the wich of Salem, Massachusetts also known as Witch City. 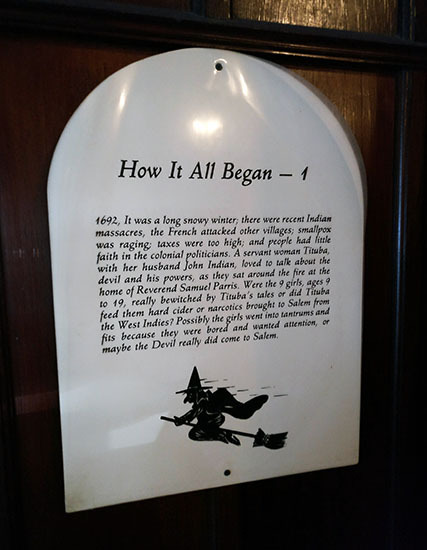 There is also the Witch History Museum, the Salem Witch Museum, the Witch House, Salem Witch Village, Salem Wax Museum of Witches & Seafarers, Salem Witch Hunt Film & Tours, the Witchery, Witch Pix of Salem, Witch Trials Memorial, Witching Hour- Live Spell Casting, and the Bewitched Statue. 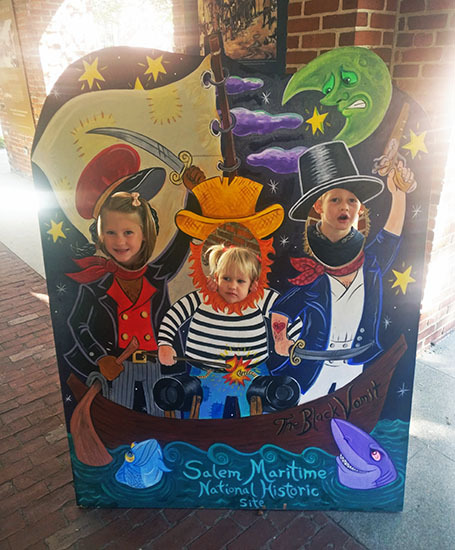 When planning out our day in Salem, we decided we wanted to visit the Salem Witch Museum. After reading up on the various offerings this one appeared to be the most comprehensive and sounded the most official. 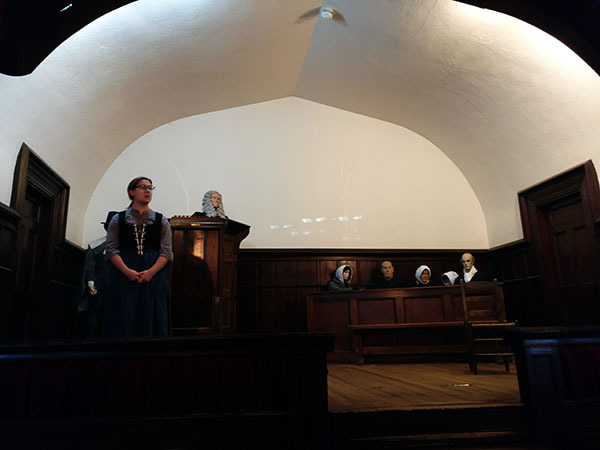 However, we got confused when we walked into the Witch History Museum instead and found they were offering a deal to visit three attractions: The Witch History Museum, The Witch Dungeon Museum and the Pirate Museum. We opted out, but in the confusion somehow decided to make our way to the Witch Dungeon Museum which offers a live reenactment and is apparently acclaimed of some sort. The exterior of this building is quaint. It is modeled after a courthouse that would have been common in 1692 in Salem. 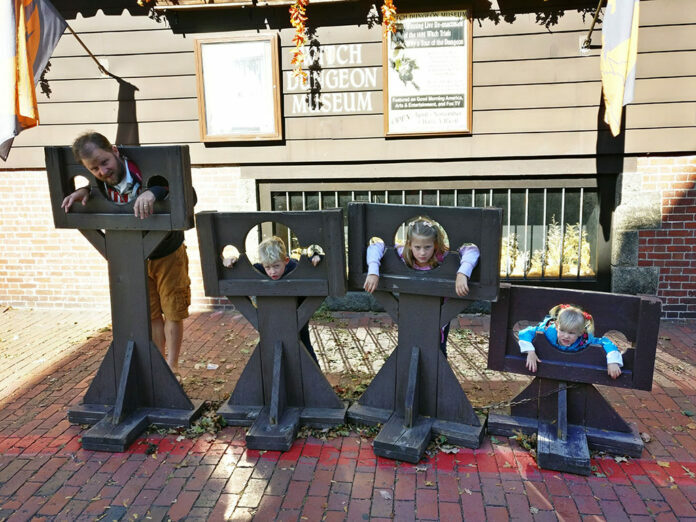 Outside are four pillories, a nice party trick for the kiddos to play in. Inside and up a stout set of stairs is the stage, and around the room are 16 plaques that tell the history of how the witch hysteria gained traction and came to be. 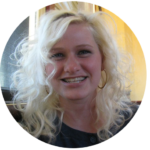 A short production, including actual transcripts from court documents is presented before the audience, and runs about 5-7 minutes long. 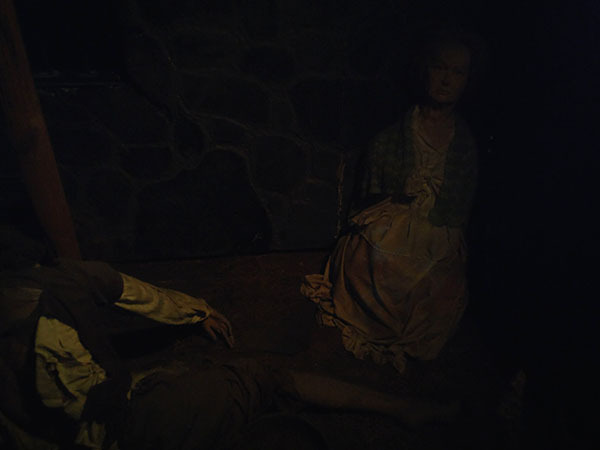 After watching the two women tuss it out accusing each other, in front of a jury of plastic bodies, head down the stairs to the actual dungeon for which this attraction is named. Inside you’ll find more extremely poor renditions of human likeness in mannequin form. The dungeons mimic the cells that witches were confined in as they awaited trial or their fate. Side by side the prison cells are depictions of Tituba, the accusers, and everyday life. It doesn’t flow in any comprehensible manner. Your guide, and narrator will share some history from the trials continuing to speak in a very weird tone, tenor and accent. The tour ends when the guide pronounces she has no more information to tell you about what happened. Then you leave. 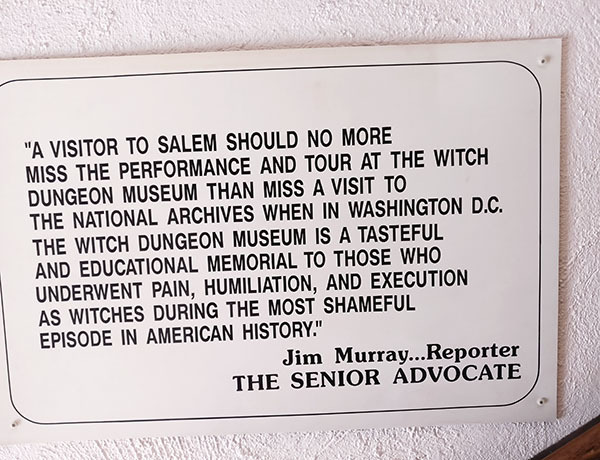 We came to learn that all the witch museums in Salem offer the same information with slightly varying presentations. All poorly done. All cheaply done. All done in bad taste. All underwhelming. All lackluster. What made this so bad was just how poor and cheap the presentation is. The costumes, the acting, the lack of updating. This behaves like a prop shop with cardboard backdrops. It feels like the owner decided Salem just didn’t have quite enough Witch attractions and he wanted his piece of the pie. Though this is a #stinkydiaper review, the entire museum isn’t all stinky. It’s actually fairly interesting to read the plaques in the auditorium as they offer a historical account of the main players in the accusations. The dialogue of the scene is said to have been lifted from actual transcripts from court documents, and as such you are forbidden from filming (seems sketchy). The cells are eerie, and you come to learn that the witches were taxed for their cell, shackles, gruel, clothing, etc. If they couldn’t pay, their next of kin would be responsible. Visually seeing the cruelty bestowed upon these people, and that they were shrouded in utter darkness, is a bit horrifying. The main problem is that the entire production, both here and elsewhere throughout town, feels like a big joke. The events which happened here are not only shocking, but they are shameful. They deserve respect, not only for the victims but for the grim actions of the entire community. In six months, 19 people were put to death. We expected a town that did more than laugh and poke fun at their expense. ► For Kids: The Witch Dungeon Museum is probably a fairly good attraction for them, if they are between five and eleven. They won’t know how bad it is, and it won’t be too scary for them to handle. Our kids had a lot of questions. When it comes to understanding, this offered a good representation of the type of language used, the accusations thrown around, the hype and hysteria that caused the fear which led to the trials, and seeing where the people were held in the dungeon prisons. Younger children, and adults, may be totally bored. Which witch attractions have you discovered in Salem wichship? Do you agree with our assessment, or did you find this attraction devilishly fun? ► Nap-Time Version: For a one-time gig, The Witch Dungeon Museum is a’right, but don’t come expecting too much, or anything at all. 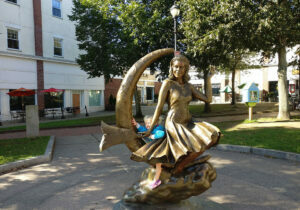 Check out the rest of our fun adventures in Witch City, Salem, Massachusetts including Frankenstein’s Castle, Howling Wolf Cafe, and Old Burying Point Cemetery.